Ahhh, I’m really excited about this one. This has to be one of the best chicken marinades I’ve ever made. The best part is, you could use this marinade for just about anything, you don’t have to make kebabs! Marinate whole chicken breasts, chicken thighs, vegetables or even tofu… The marinade is just plain fantastic. The tandoori marinade comes together fairly quickly but you’ll want to let it sit, soak and marinate for at least four hours if not over night. So, think ahead just a bit and prepare this the night before. Then when you’re ready to cook, just take it out, slap it on the grill (or George Foreman) and you’ll be eating in no time. If you don’t have any turmeric, I’d be confident saying the marinade will still be killer. Curry powder would also be pretty awesome in there. Oh yeah, I buy large, 5 lb. 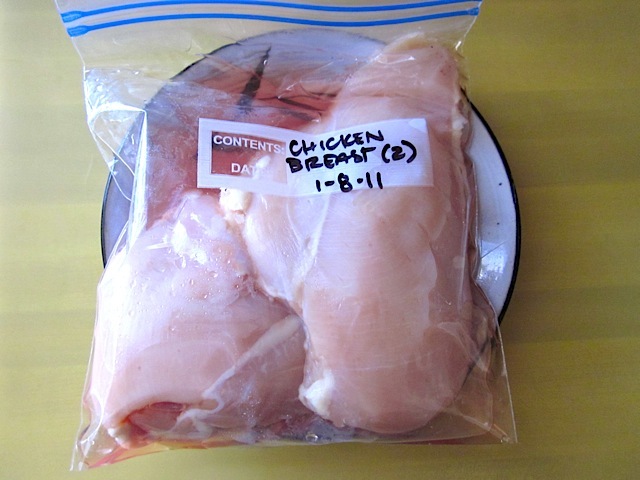 packs of chicken breasts for the discounted price and then freeze packs of two. 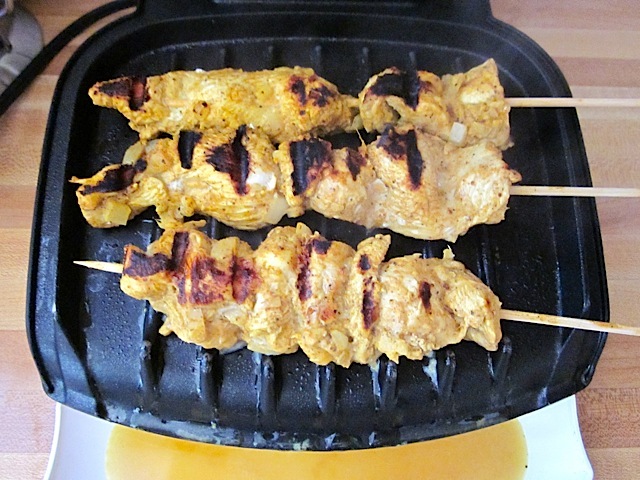 So, this recipe calls for two breasts which gave me about three servings (2 kebabs each). The amount of marinade that this recipe makes could easily support four chicken breasts. Any more than that and you’ll want to double the marinade ingredients. Serve the kebabs over jasmine rice or with dal nirvana and naan. I always buy a huge 5 lb. pack of chicken because it’s at least a dollar less per pound. 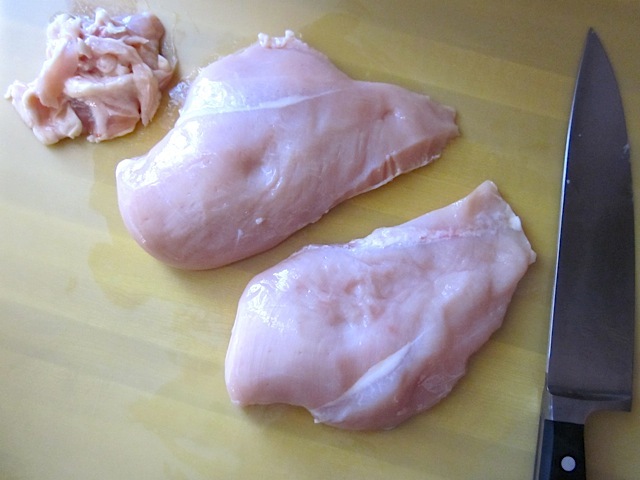 Then, when I get home, I split it up into bags of two breasts each and refreeze. 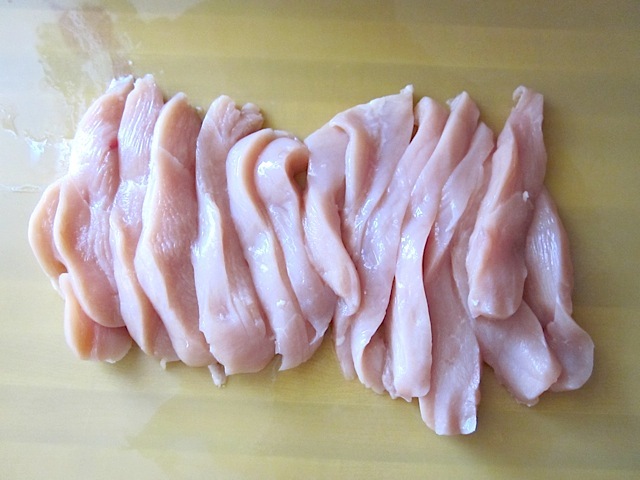 Trim the fat off of the chicken and cut into thin strips. 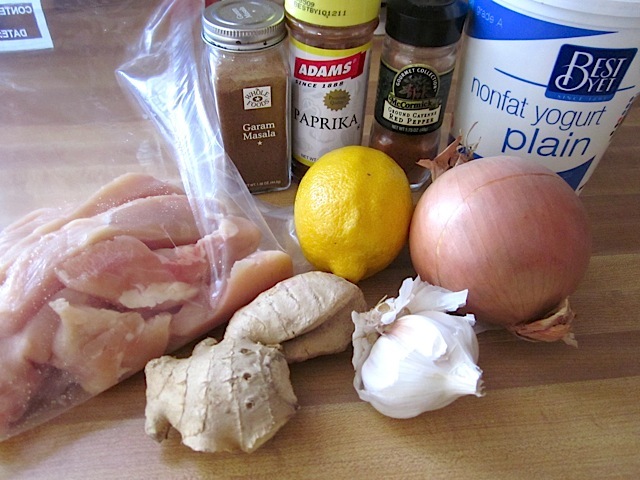 These are the ingredients for the marinade: yogurt, lemon, onion, garlic, ginger, garam masala, paprika and cayenne. Plus salt and turmeric (I forgot to put those in the picture). 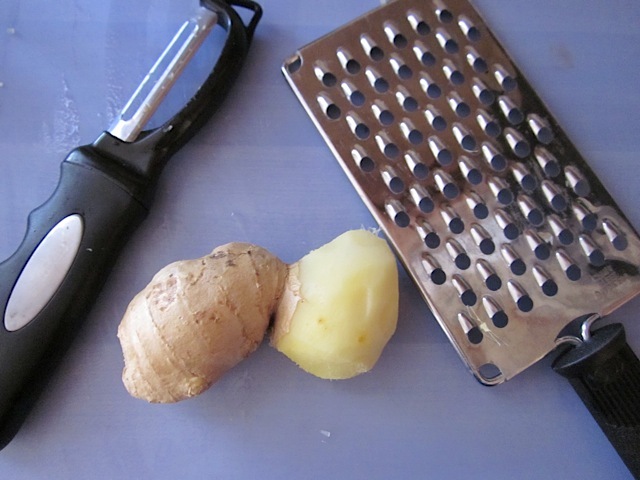 To easily “mince” the ginger just peel with a vegetable peeler then run it across a cheese grater. It takes seconds and there is no fumbling with a knife! 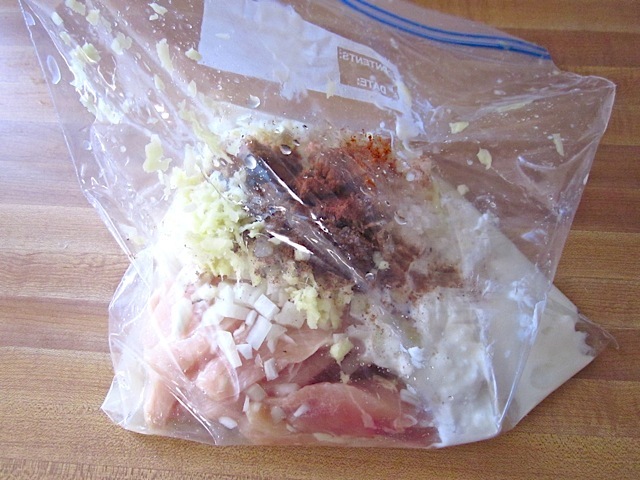 Add all of the ingredients to the marinade bag, close it up and then mix really good. Dice the onion and garlic as small as possible so the maximum amount of flavor leaches out of them. 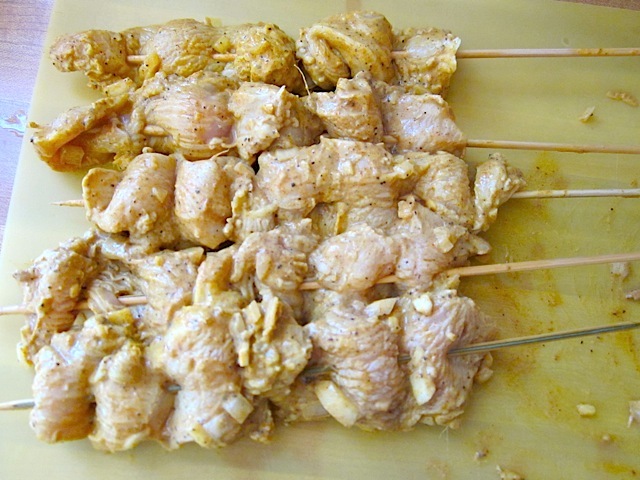 Marinate the chicken over night or for at least four hours in the refrigerator. I ended up adding a teaspoon of turmeric for that classic yellow tandoori color. 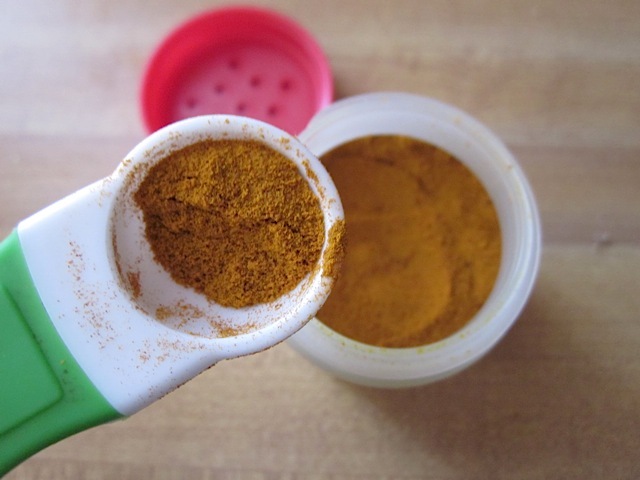 Just beware, turmeric will stain everything… even your finger nails. 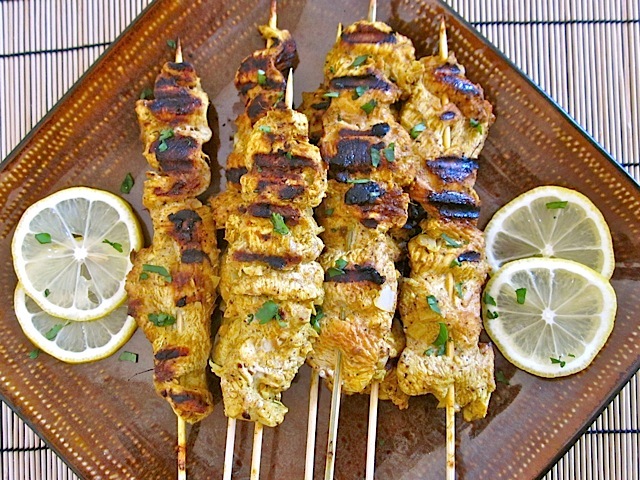 String the marinated chicken strips onto skewers… or just grill them by themselves. They’ll taste the same either way! 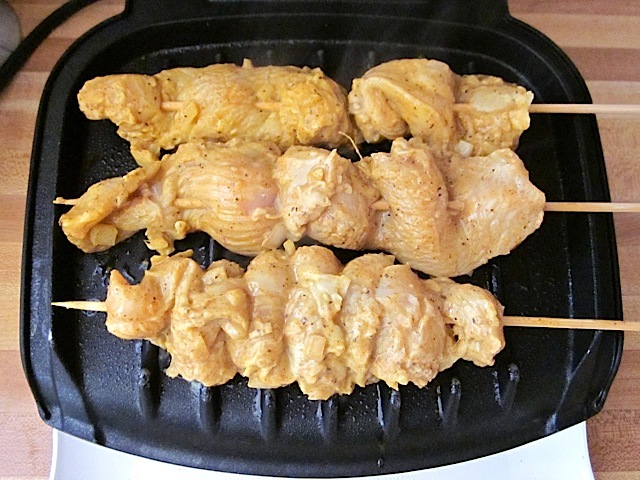 Preheat the grill for five minutes then place a few skewers on. Close the lid and cook for three minutes. Flip the skewers and grill for three minutes more. I did this because the bottom side was in contact with all of the liquids dripping off and therefore did not achieve nice grill marks. After flipping and cooking longer, both sides had grill marks. 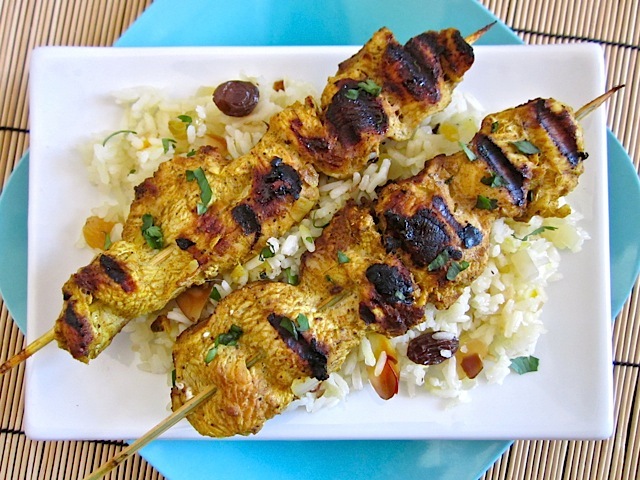 These kebabs were made for laying on top a bed of rice pilaf. Kebabs are really difficult to photograph but I forgive them because they taste so good. Beth! So, I wanted to try this with cauliflower and did some research. I found a method to oven-roast tandoori cauliflower florets. I am going to use your recipe for the marinade though, because it’s just a bit simpler than others I read AND because I never doubt your recipes! I’ve made your dal nirvana and cashew pilaf before and I’m craving an Indian feast! Just wanted to post in case anyone wanted to try a cauli/roasted version. I’ll post with my results. Thank you again, Beth, for being the most trusted recipe site I’ve ever cooked from! I can’t wait to try this! It’s a short type of recipe pls mention all ingredients of the recipe..like a to z …it’s very helpful to other views…i have also a chef that’s why i can understand,type of cooking.. Delicious! I followed the recipe exactly and served it with your cashew rice pilaf – though I added cardamom to the pilaf recipe. I will definitely make this combination again! You should include the skewers in the ingredients/price list. I use that list to shop and almost forgot to buy them. Anyway, this turned out amazing! I made the trio with yellow rice and curry chickpeas. I cant seem to find any Garam Masala anywhere, I wonder if I can do without it or would the whole recipe taste different? Also can anyone suggest any substitutes for this? Thanks!! Yes, the garam masala is very important to the flavor of this, but you can make up your own blend if you can’t find it. Here is a simple recipe for the blend, so even if you don’t have all of the ingredients you can wing it with at least some of them.